This is a guest post by Noah Wass- Plastics Engineer, bicycle expert, and owner of BikeInReview.com where you will find professional bike related reviews and interesting biking news. Subscribe to his newsletter here. The bicycle was invented all the way back in 1817. A certain Baron Karl von Drais needed to get around easier while working in the Royal Gardens and came up with the idea of sitting on a platform with two wheels and propelling himself with his feet. This particular machine was called the Draisine or “hobby horse” and about the only thing that it has in common with bikes of today are its two wheels, steering capabilities, and seat, but from these humble origins, the bicycle was born. There were many different bicycle designs that were tried before the standard of today’s concept of two similar sized wheels was realized as ideal. The most common of these alternate designs is the “penny-farthing” bicycle that had an extremely large front wheel which was pedaled directly by the rider. Other designs included tricycles with varying wheel diameters and even four wheeled machines that had wheels that steered in the front and back. As interest picked up surrounding the idea of using a self propelled vehicle, and as manufacturing technology improved, bicycle technology advanced significantly. Something more closely resembling bicycles of today first appeared in 1886. John Kemp Starley’s “Rover Safety” bicycle was the first to incorporate two wheels of the same size, pedals, a drive chain to the back wheel, and pneumatic tires. The rise of the automobile in America slowed the growth of the bicycle as the convenience of driving a car largely outweighed riding a bike. The fad stuck in Europe, however, and people were still using bicycles in races and touring around the countryside. Cyclotouring in France helped with the invention of the modern derailleur (the variable-ratio gearing system with different sized sprockets and a mechanical system to move the chain from one gear to another). They could have come up with a better name in my opinion, but it stuck. Invented in 1910, it has since made countless rides more enjoyable! 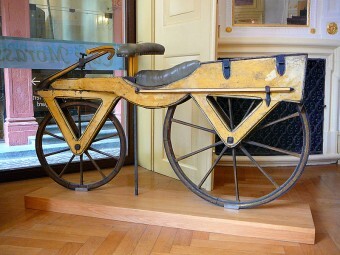 Most early bicycle designs were made of wood and were very uncomfortable to ride. Some earned the nickname, “The Boneshaker”. The concept of the bicycle was realized as early as the 1490’s by one of Leonardo da Vinci’s students. The bicycle pedal was created in 1861. Early racing bikes had two gears, one on each side of the rear wheel. If a racer wanted to ‘change’ gears, they had to remove the rear wheel, flip it over and remount the wheel. Read more interesting articles by Noah Wass on Bike in Review and subscribe to his newsletter here. This article (admittedly from a guest, but claiming to be an ‘expert’) is a little short on the usual TIFO quality. KIRKPATRICK Macmillan lived a largely ordinary life and died in relative obscurity. But this Dumfriesshire blacksmith was responsible for one of the greatest inventions of the Victorian age – the pedal bicycle. Macmillan’s inspired decision to add pedals to the two-wheeled “hobby horse”, originally developed by the German Baron von Drais, might have made him rich. But he preferred simply to cycle the machine he invented – on regular trips to Dumfries, 14 miles from the family home near Thornhill and on one epic two-day journey to Glasgow – and allow others to make the money and take the glory. It was only 50 years after he completed his first machine in 1839 that his role was at last recognised. But even today, it is a subject of controversy.